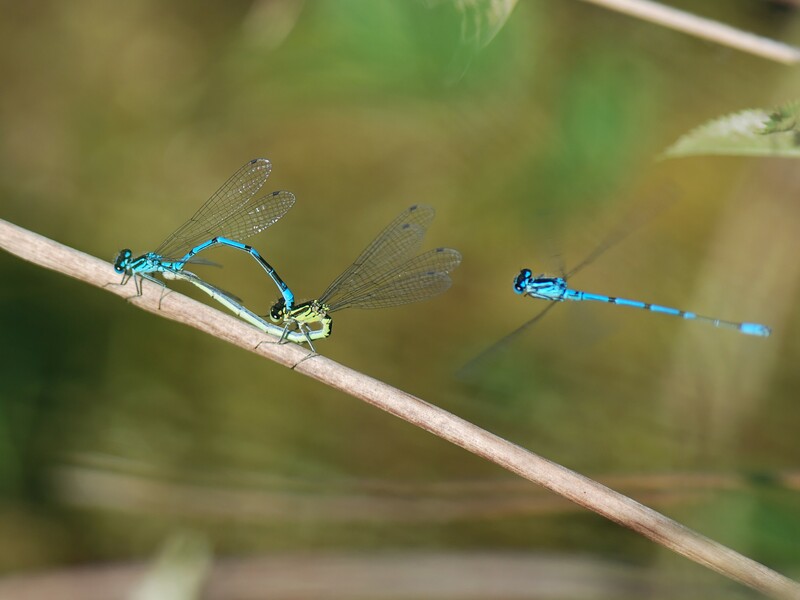 Damselflies (Zygoptera) have 2 pairs of wings with a similar shape which are usually held alongside the abdomen when the insect is at rest. 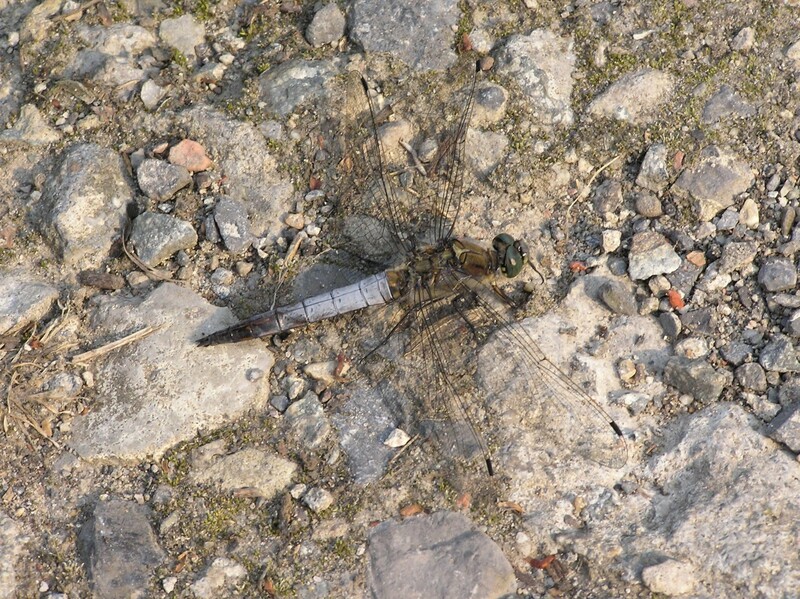 Dragonflies (Anisoptera) have dissimilar shaped pairs of wings which are held wide open at rest. Odonata are a primitive group of insect (Palaeoptera*) that includes only odonates and mayflies. They are unable to fold their wings back over their abdomens. Their wing muscles are attached directly to their wing bases. All other winged insects (Neoptera*) can fold their wings back and their wing muscles are attached to their thorax. Another primitive aspect of Odonata is that they undergo gradual metamorphosis as do grasshoppers, cockroaches and shield bugs. Unlike butterflies and beetles they do not have a pupal stage and dragonfly larvae (nymphs) have a similar appearance to the adult. The nymph undergoes a series of moults as adult features mature within and the adult simply emerges during the final moult. 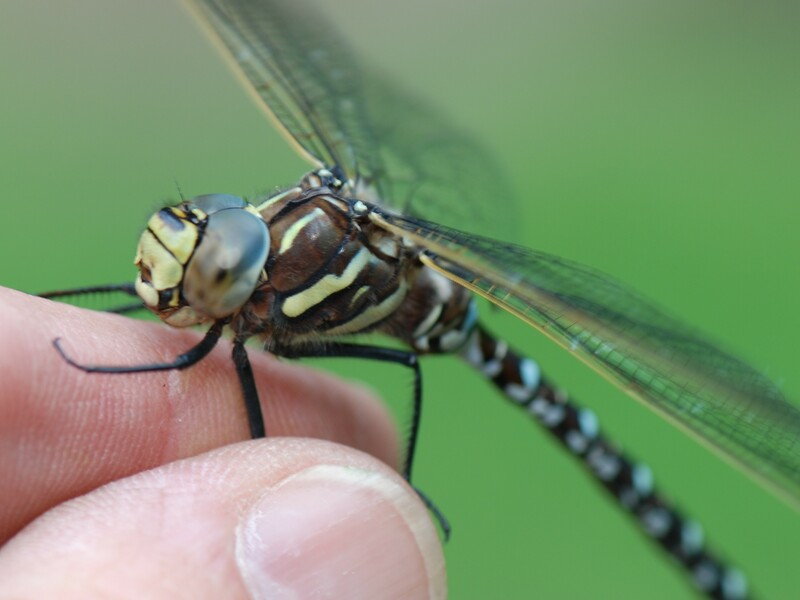 Larval development lasts from one year up to five years for large dragonflies living in cold habitats with a minimal food source. Emergence is triggered by increasing day length and rising spring temperatures. 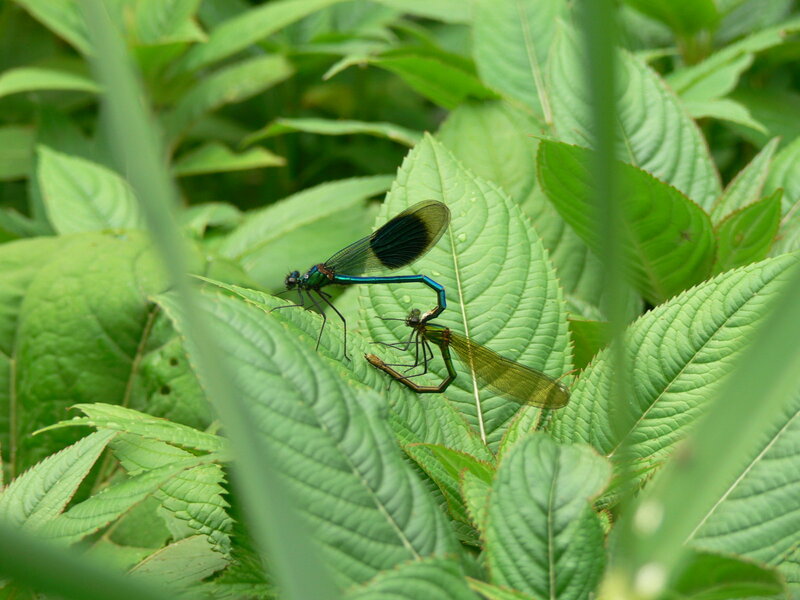 The lifespan of Damselflies is around 2 to 4 weeks and that of Dragonflies is 2 to 5 weeks. 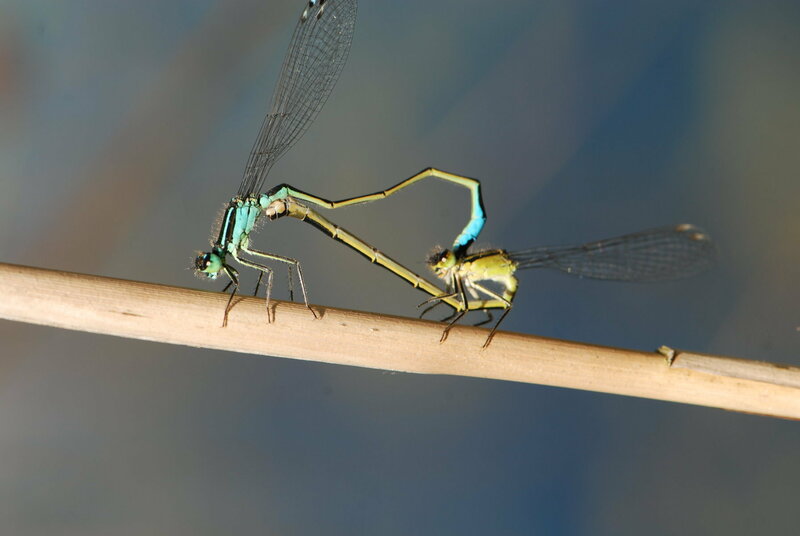 Like all insects, dragon- and damselflies breathe through openings in their bodies called “Spiracles”. Air can be pumped in by expanding their bodies although the amount of inspired oxygen is limited with such a system. However, during the late carboniferous age about 300million years ago, there was much more oxygen (35% compared to the present 21%) in the atmosphere and this enabled insects to grow very large… up to 75cm wingspan in the case of the giant Meganeura dragonfly. This would easily have been able to catch modern-day birds! 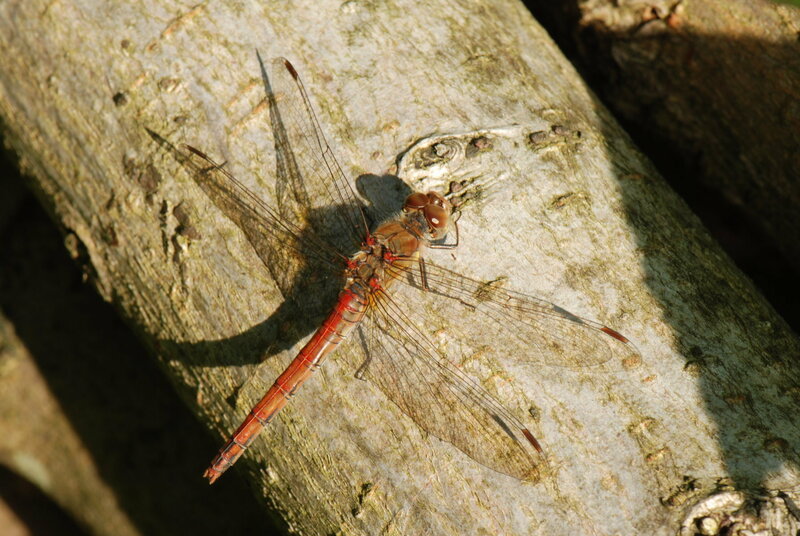 Dragonflies (and damselflies) may be an ancient insect group but they are superbly evolved; – particularly their wings. 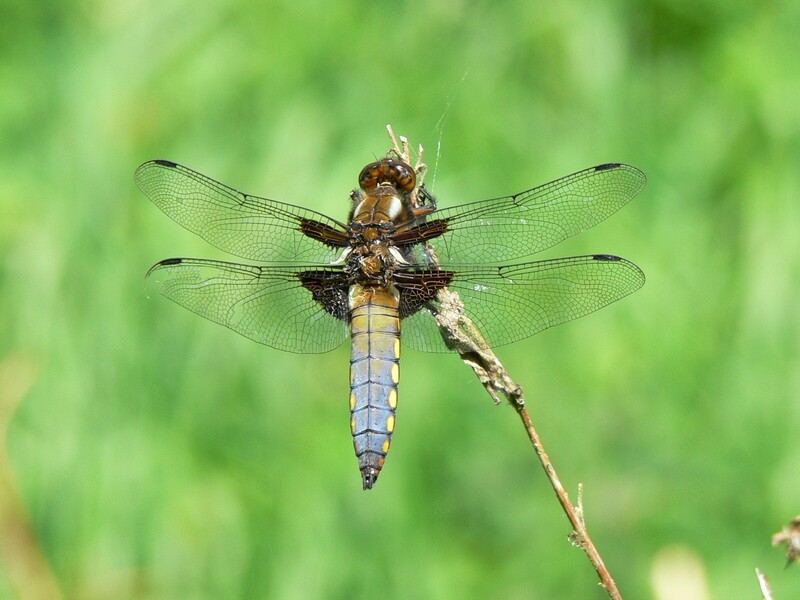 As seen in the close-up of the Four-spot Chaser, a dragonfly’s wing is pleated. Research has shown that this not only gives rigidity to the wing, but, if the outer points of the wing structure are jointed up, the enveloped shape forms a cross-section of an aerofoil. This provides lift for flight and the grooves formed by the pleats produce tiny vortices that reduce drag to give a better lift-to-drag coefficient than the enclosed aerofoil shape itself**. And the Pterostigma? This wing cell is heavier than the surrounding areas of the wing and prevents the onset of resonant vibrations that would make gliding at speed impossible. 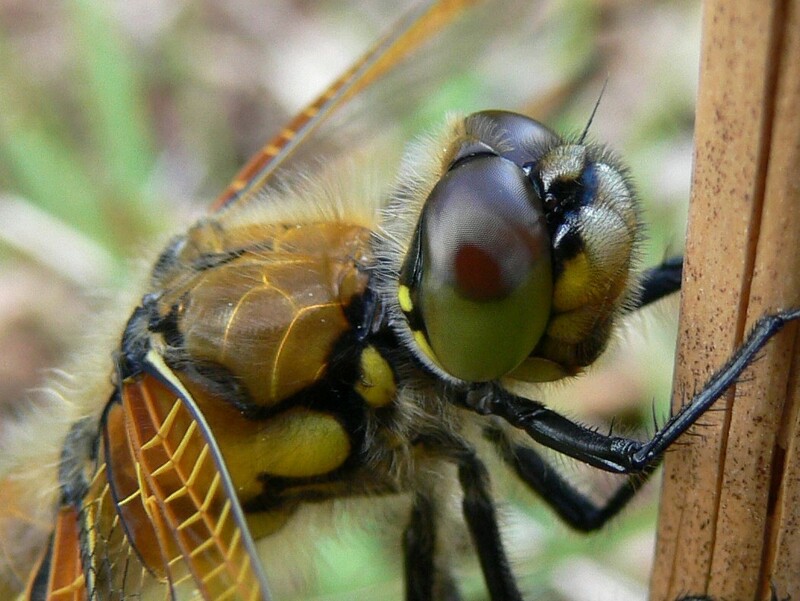 Dragonflies were efficient flying machines many millions of years before birds evolved! Had man been able to study dragonfly wings before those of birds we perhaps may have created flying machines a long time before we did? One species found in the wood but not shown here is the Brown Hawker. Black-tailed Skimmer Orthetrum cancellatum. Seen in its classic habitat near water hawking over and resting on bare ground. It was a new record for the wood in 2009, and is especially notable as it is outside the insect’s normal range. Azure Damselfly The pair seen here in the “wheel” position. Four-spotted Chaser showing compound eyes and pleated wing structure. 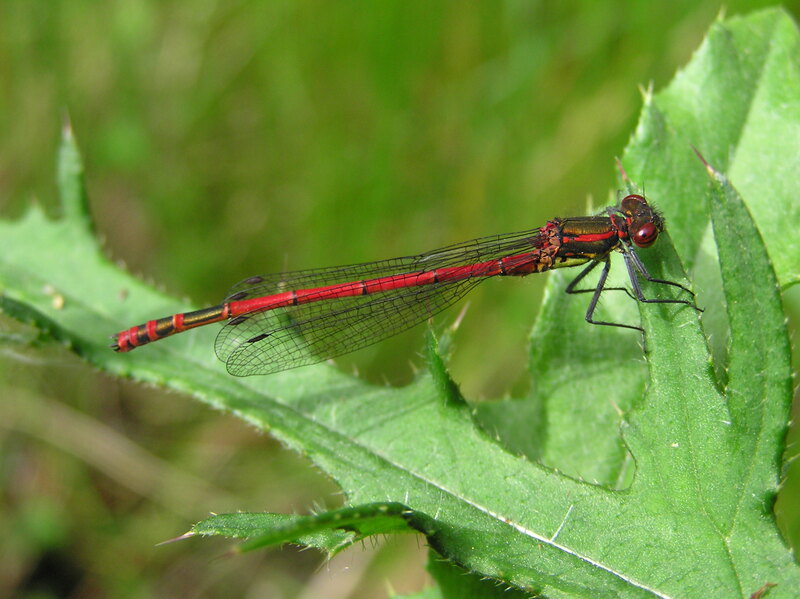 Large Red Damselfly Pyrrhoso manymphula is the first species of the year to emerge and is a sign that Spring has truly arrived.